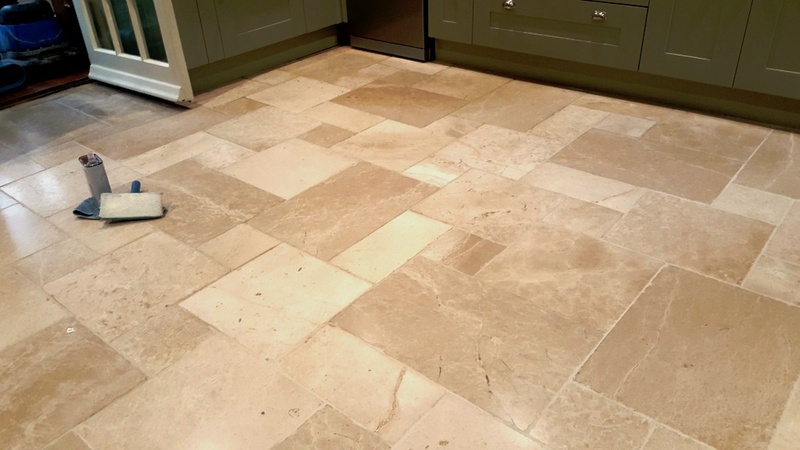 Travertine is a lovely beige and brown stone that looks fantastic when it’s first laid but needs work to maintain the appearance. This was exactly the problem my customer who lives near the historic Cathedral City of Lincoln had experienced. 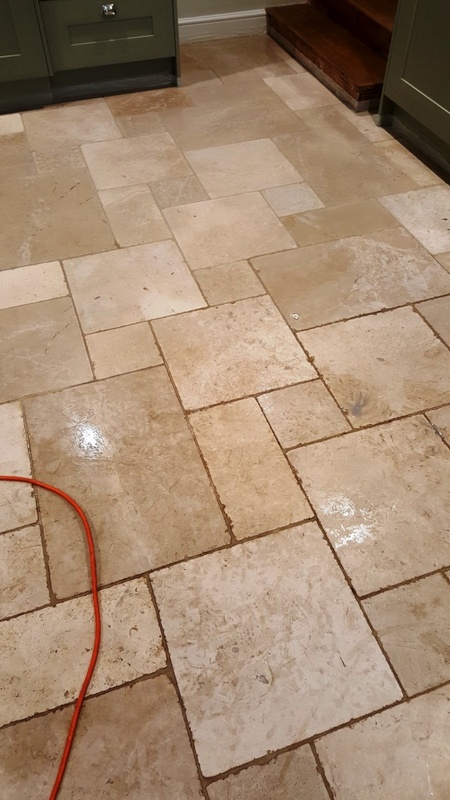 The sealer on their Travertine Kitchen floor was becoming worn in the more commonly used parts of the floor letting dirt become ingrained into the pores of the stone and the grout was also becoming darker where it was getting dirty. They also had pets that spent a lot of time in the Kitchen which didn’t help and there were also small holes in the Travertine that were trapping dirt and would need filling. 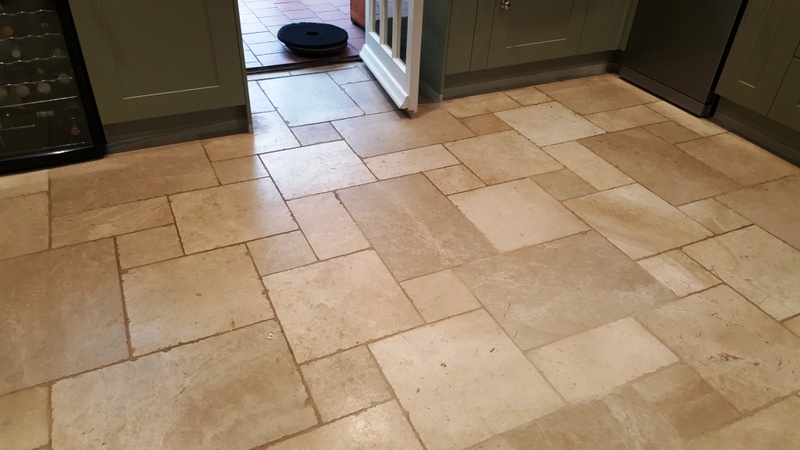 To deep clean the stone and grout I applied a strong dilution of Tile Doctor Pro-Clean, left it to soak in for ten minutes and then worked it into the floor using a scrubbing pad fitted to a rotary floor machine. Pro-Clean is a strong reliable alkaline product which is safe to use on stone and grout including Travertine and Limestone. I also ran a stiff grout brush along the edges of the floor and especially along the grout lines to get the grout as clean as possible; the scrubbing pad struggles to reach into the recesses of the grout so it’s best to do this by hand. The now dirty cleaning solution was extracted from the floor using a wet vacuum and rinsed with water to ensure the tile and grout was now clean and any stubborn stains spot treated. After the deep clean we filled the holes as required using flexible filler which gives a really smooth look to the flooring. We then left our turbo dryer system on overnight to thoroughly dry out the floor before returning to seal the tiles on day two. 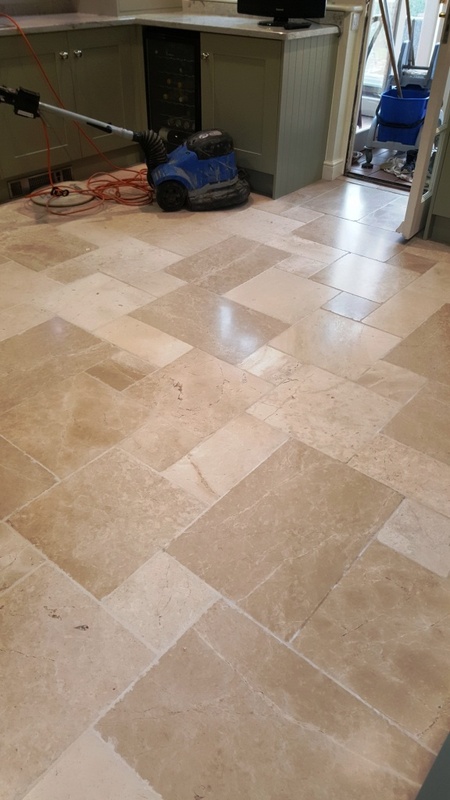 The next day I returned to the property and proceeded to seal the Travertine tiles using two coats of Tile Doctor Colour Grow sealer to protect the tiles and also really enhance the natural colours in the stone. As an impregnating sealer, Colour Grow penetrates into the stone and fills its pores to safeguard it against ingrained dirt and stains from within. As you can see from the photographs, the combination of a deep clean, high quality polish and fresh seal really transformed the appearance of the floor from dull and lifeless to a really asset to the kitchen. The customer was so happy with the results she has booked us in to carry out the same work to other flooring in the property. 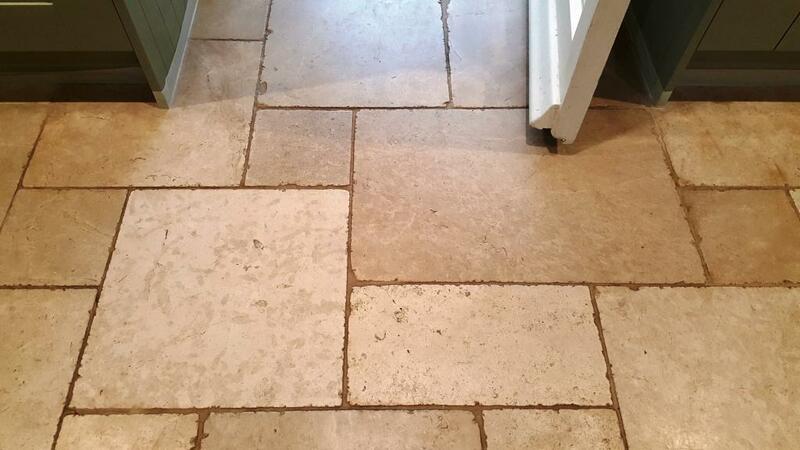 This entry was posted in Work History and tagged cleaning, Cleaning Travertine, Holes in Travertine, Ingrained Dirt, kitchen floor, lincoln, Lincolnshire, Pets, sealing, sealing travertine, Stone Cleaning, Tiles, travertine kitchen tiles by AbzDominise. Bookmark the permalink. Covering Lincolnshire and the surrounding area Phil Barrs is an agent of Tile Doctor, the largest Tile, Stone and Grout cleaning network in the UK who have developed the products and techniques to handle a multitude of issues surrounding tile restoration including Travertine and Travertine internal or external.